This past week marked the release of DC’s two biggest books in a long time, Flashpoint #5 and Justice League #1. These two books mark the end of an era for DC comics and the ushering in of a new mindset and a new universe. 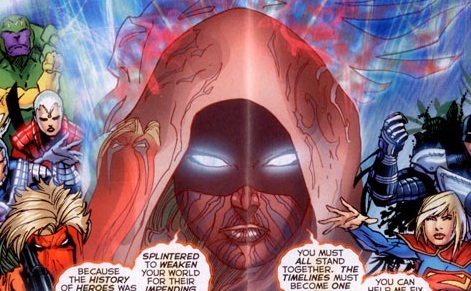 One thing I noticed in Flashpoint #5 was a mysterious woman giving Barry advice. Admittedly she wasn’t hard to miss and as I read on I just took it for granted that I didn’t recognize her and she was just a character with which I was not familiar. Today however Comic Book Resources is reporting that this mystery woman showed up in Justice League #1 (harder to spot this time) and their sources claim that she will be showing up in every single first issue that is coming this month. Now this makes me wonder if we are seeing the beginning of the first company wide event post-relaunch or possibly something else entirely. Will she be put in there to help readers transition from the old DCU to the new DCU, possibly helping to explain to us the changes that were made. I think it will be exciting to find out and I hope the mystery of her is revealed relatively soon. Now I will definitely be scanning each issue of the new series looking for her.